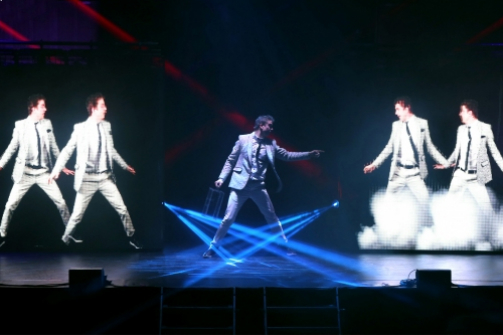 Adam Trent in The Illusionists. Photo by Vanessa Viana. BOTTOM LINE: An evening that brings together tradition, excitement and entertainment and unites the audience through wonder, comedy and just the right amount of corniness. One common assumption that is always present whenever an audience witnesses a theatrical event is that they'll agree to suspend their disbelief. Said agreement allows for the theatrical game to become something bigger than itself, for the artists to embody archetypes, and for the audience to meditate on something more than their individual universes. The Illusionists, a group of seven performers from different corners of the globe, come together on Broadway not to create a never before seen magic show, but to contribute to its survival and to remind us that magic is still powerful and necessary, thus earning our attention and the suspension of our disbelief (instead of taking it for granted). Hovering above the empty stage is a large and bright LED panel that carries the name of the show. High up to the sides on the seating areas is the band. From inside an empty acrylic box all seven performers appear, each with a title of his own. Dancers, lights, and smoke tricks complete the scenery. The first to perform is The Deceptionist, James More. Delivering the big disappearing acts and working in tandem with the ensemble of The Illusionists' interns and dancers, he displays showmanship with an edge of a Hollywood action movie star. He is followed by The Trickster, Jeff Hobson, who also serves as MC and ties all the other numbers together with great ease, commanding the audience, the show, and his own act. Then, one by one, we're introduced to the other performers. The Anti-Conjuror (and YouTube celebrity) Dan Sperry is in charge of the gross and agonizing numbers of the evening backed up by a heavy metal speedy soundtrack. Sperry's attitude is akin to that of figures like Marilyn Manson and his talent is camouflaged by the messiness of his performance. His charisma, undeniably his own, also seems to carry that bit of controversial sexiness one might not want to admit. The Unusualist, Raymond Crowe, follows suit but changes the atmosphere almost completely by presenting a delightful new take on ventriloquism. Crowe's act is delicate, endearing and lyrical. His is also one of the highlights of the evening. And What A Wonderful highlight it is. The standard card tricks make their first appearance in the hands of The Manipulator, Yu Ho-Jin. With extreme elegance and a smooth demeanor, Ho-Jin, a South-Korean magic wunderkind, delights the audience and suspends time before our very eyes. Technology and magic join hands for the numbers of The Futurist, Adam Trent. Displaying a small town boy's charm and a genuine smile that makes it all seem simple and easy, his numbers have just the right amount of comedy, cheesiness and wonder. Last but not least is The Daredevil of the ensemble, Jonathan Goodwin. His are the numbers that make the entire audience hold their breaths, sit in complete silence and clutch on to their friends or seats' arms in response to what's to come. Without straying away from the magic tricks we've all seen or heard about, The Illusionists also fill the stage with comedy, theatrics and live music while counting on audience participation to (re)create an atmosphere of childish wonder and amusement towards the unknown. They bank on that small yet persistent part of ourselves that instantly connects to the unexplained and to the dumb reward that comes from being tricked. Here and there there were moments when a pragmatic audience member, yours truly, attempted and managed to see beyond the illusion. That was not due to the performers' incompetence or lack of talent, but rather to abilities most of us end up developing in order to become adults—an objective eye, a pragmatic attitude and a sense of practicality—I was reminded of the role magic plays in our lives, how it helps nurture that portion of our perception that turns details into small wonders and adds taste to the dullness of our routines. The Illusionists banks on a tradition that, albeit not without its out-dated traits such as the use of female assistants as targets or helpers, deserves to be maintained and shared with the public. It also honors the tradition of Broadway shows with high production values, talented performers, and a grand team of artists that make their presence and artistry known through lighting (Jared A. Sayeg), rad, dapper, and sober costumes (Angela Aaron), acrobatic routines and athletic choreography (Jenn Rapp) and original music (Evan Jolly). A great choice for the whole family and a good possibility for tourists and New Yorkers alike. The Illusionists is created and directed by Neil Dorward along with creative producer Simon Painter and executive producer Tim Lawson. Lighting design by Jared A. Sayeg, costume by Angela Aaron, video design by NICE Studios and illusion design by Don Wayne. Illusion director is Mark Kalin. Associate director is Kirsty Painter. Associate director and choreographer is Jenn Rapp. Resident director is Rachel Bickerton. Composer is Evan Jolly with additional compositions by Eddie Cole and Dustin Moore. Production stage manager is Mark Dobrow. It features Raymond Trent, Jonathan Goodwin, Jeff Hobson, Yu Ho-Jin, James More, Dan Sperry and Adam Trent as main acts; Kenny Bermudez, Tenealle Farragher, Katy Goodwin, Todd Hampton, Tiffany Marie, Chris Matesevac, Nicole Medoro, Ida Nash, Eddie Shellman as The Illusionists interns and dancers.